Did You Know? This home can be booked at a 3 night minimum. Change dates if desired. Just 420 feet from Bonnet St. beach access! 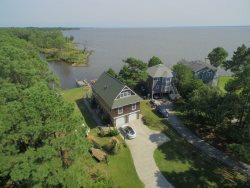 Steps from the sea, this vacation rental home in the heart of Nags Head is sure to become your Outer Banks sanctuary during your next escape to barrier island paradise. The sandy shoreline is just one block away (420 ft) and easily accessible via the Bonnett Street beach access, which also features a brand-new bath house for the 2018 season, a volleyball court, picnic tables and a lifeguard station during the summer months. In addition to its convenient location just down the street from the Atlantic Ocean, Sanctuary is also right across the street from Galaxy Golf—a 36-hole miniature golf course with an outer space theme—and within walking distance from Tortugas Lie, one of the most popular Outer Banks restaurants among locals and visitors alike. Dowdy Park is also just a short walk (530 ft) down the street from this cozy cottage and boasts playground equipment and recreational opportunities for kids of all ages. Across the way from the park and down the same street is the local YMCA (1050 ft), which offers weekly and daily passes and hosts indoor/outdoor swimming pools and a multitude of exercise equipment. With three spacious bedrooms—a queen master bedroom, queen bedroom and bedroom with two twin beds—Sanctuary has plenty of room for everyone in your family. This charming Nags Head vacation rental also offers bicycles, corn-hole, a horseshoe pit, beach equipment, and a crow’s nest, which is the perfect spot to soak up the sun and catch an ocean breeze while enjoying an ocean view. Book your stay at Sanctuary today! Ground-Level: Laundry Area, Enclosed Outside Shower, Parking.